Please Note that both BPEL as well as Mediator are the complementary components and do similar tasks. BPEL is process based and Mediator is routing based. BPEL is usually for long running process where as Mediator is for short and fast messages. As stated this blog is about design Interaction Pattern between Mediator and Sysnchronous BPEL process . Example -In this example we have WebService that will take Input for Sales Order and call Mediator process. 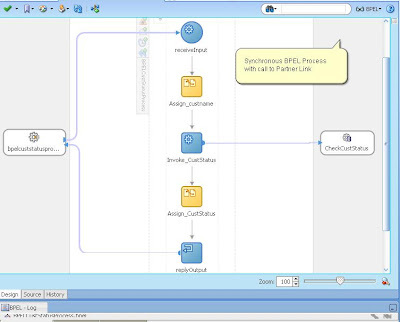 If Order Price is < 50 Mediator route the flow to Partner link Service to Insert the data into Sales Order Table. If Order Price is > 50 Mediator route flow to BPEL Process , to validate Customer Raiting. We can also define Sysnchronous Reply in Mediator Process.In My example I define Sysnchorous reply as SERVICE to Insert the Sales Order Data in table. Below is complete flow of my Process. I have Web service to received Input , Meditor to Route the process.BPEL to Validate the Rating and 2 database Adaptor to validate the data. Define your Message Structure ( Structure for your Input data).In my case I have defined a simple Order Structure with few elements, as shown below. Let user Enter Sales Order data Manually. Insert Data into Sales Order Table if Order less than 50. Validate Customer rating if Order More than 50 and then Insert into Sales Order table. Define a Partner Link by Dragging "Database Adapter" from Component Palette , drop it in External References, name it "InsertOrder". Configure this database adapter to Insert the data into so_info table.Please note that in my example structure of so_info database table and "OrderInfo.xsd" file is same. 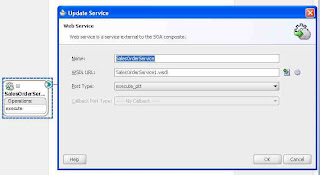 Configure the Mediator component to Insert data accepted as Input in webService to "InsertOrder" partner link as shown below. As part of requirement 3 , I need to validate the customer rating if Order amount is MORE than 50.For that I have designed a BPEL Process which will take "OrderInfo.xsd" as input and then call the PartnerLink "CheckCustStatus" to check the Credit Status of Customer. structure with input and output variable. Process Response Message , please verify that.If it is not assigned yet , assign that as shown below. 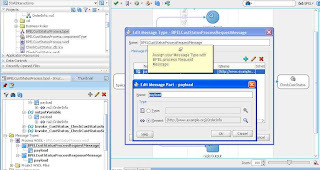 (Refer muy blog http://eoracleapps.blogspot.com/2009/10/how-to-create-bpel-process-to-insert.html to learn more). As shown above I have selected -Message Type > Process WSDL > Assign the OrderInfo Structure to Request and Response Message Type. 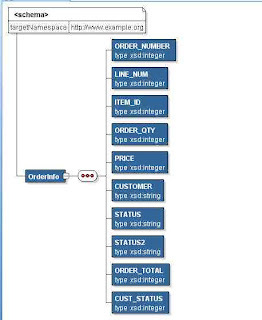 Below is the BPEL Process , this Process Take the Input data in OrderInfo Structure and then Read the Customer Name and Get Credit Rating for the Customer.I am using the "Database Adapter"Parther Link to read the customer credit rating from database table. Once BPEL Proces is ready configure Mediator to Call the BPEL Process to validate rating if Order Total is Greate than 50 as shown below. Mediator Structure . - Here I set the Routing Rules. I have a dought and this question is my asked me ? 2)can i use the mediator to pick the data from mediator ? Mediator - it is mostly used as BUS and for routing purpose,plus we can used mediator to capurure events. as per your question "can i use the mediator to pick the data from mediator " , can you please provide some additional details like how and what data you want to pick. I have to route to 3 different places after transformation... 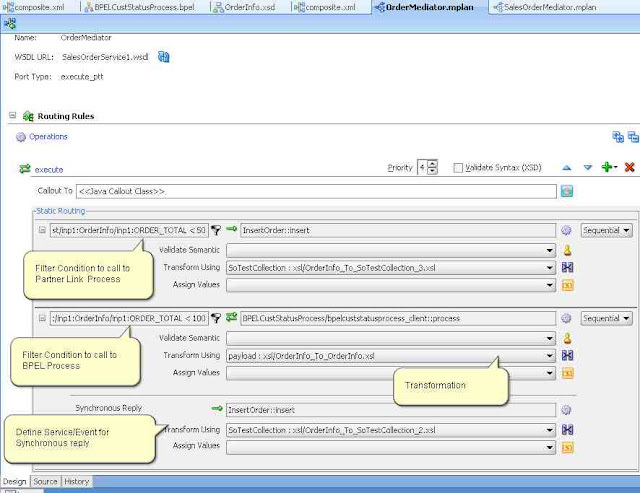 But if i am able to transform it in the Mediator then what is the use of BPEL Process ?? In which situation we use pick activity? has its condition satisfied first is executed. exclusive (the process either receives an acceptance or rejection message, but not both). double-click the Pick icon, the pick activity displays these two branches: onMessage (on the left) and onAlarm (on the right). The onMessage branch contains the code for receiving a reply, . Well it's all depend on your Technical an business need . How to generate xml from another xml? Where there are many tools that will help you do so , but what actually your requirement is ?